Fred D. Price, Dayton OH, from the book "Pond Creek And The Letter Box". On the 1910 Owsley County KY census, Belle says Bent Moore is her 3rd marriage. 1870 Owsley Co. KY Census by Myrna G. Seal, Indian Cr, HH 12 - 1869. 1910 Owsley Co. KY Census, Island Cr. Precinct. James Robinson, husband of Lena Marie Campbell, granddaughter of Samuel Campbell & Laura Belle Napier. Father: William Franklin COLE Jr.
1880 Jackson County KY Census, the River Precinct - "Nivey". Civil War Pension Record of William F. Cole. PAGE: Family Report dated Jan 15, 1898. Based on age of 1st child on 1900 Breathitt Co. Census, Crawford Precinct. On the 1840 Hendricks County Census, daughter of Daniel Davidson and Jane Thomas is born between 1825 and 1830. (We can probably narrow this down just a bit because Daniel and Jane were married in July of 1826 in Kentucky, and on the1850 census, Samaria states she is born in Indiana). On the 1850 Hendricks County census, living next-door to Daniel and Jane is Samaria, born 1829, married to Tarlton Bales. For the time being, I am presuming that this is their daughter. 1830 & 1840 Hendricks Co. IN Census. PAGE: Walnut Creek Cemetery,, Franklin County, Kansas. Indiana Marriage Index, 1800-1941 on Ancestry.com. Indiana Select Marriages Index, 1748-1993 on Ancestry.com. New headstone picture on the Owsley Cemeteries MyFamily website. PAGE: Wilson, Strong & Smith Cemetery. In the Civil War Pension Record of Elizabeth Duff (Dependant Mother), it states that when Vardman was 14 years old, he was handicapped, having no use of one of his arms. Dependant Mother's Pension for Henry C. Duff. 1880 Owsley Co. KY Annotated Census by M. M. Hayes, District 80, HH 87. Death record on Ancestry.com website. 1880 Breathitt Co. KY Census, Jetts Creek Precinct. Carmack pages on the internet. Scott Hensly of Madison County Arkansas, from Linda Price Pruit. Gracie and Bertha were twins, as shown by their ages and as noted on the 1910 census. Grace Marshall, 69, passed away -January 4 at her residence on White Oak. She was a member of the Church of Christ and a native of Owsley County. Survivors include her husband. William H. Marshall of Booneville; one daughter, Lou Sizemore of Booneville; four sisters, Mary Tirey and Lona Remaly, both of Booneville; Mrs. Elizabeth Protsman of Cincinnati, Ohio; Mrs. Lucy Gurlan of Louisville, Kentucky; three brothers, Harrison Sizemore of Cloverbottom, Kentucky; . Logan Sizemore of Vicco, Kentucky; Woodrow Sizemore of Oxford, Indiana. Funeral services were conducted at 1 p.m. Thursday, January 7 at the Searcy and Strong Funeral Home with Rev. Joe Powlas officiating. Burial was in the Griffith Cemetery. Searcy and Strong Funeral Home, was in charge of arrangements. 1930 Owsley County census in mother's houshold, married 5 years, no children. Headstone at Griffith Cem. Southfork, Owsley Co. KY.
1910 Owsley Co. KY Census by Robert L. Smith, Island Cr. Prec. 1930 Owsley County, KY Census, District 4, Magisterial Dist. 3, Island Creek Precinct. Although I have William Sizemore and Anna Asher as the parents of Henderson Sizemore ( (m. Minerva Combs), they may actually be the adoptive parents. In recent research, I have found that there was a couple in Clay County named James Sizemore and Elizabeth Fields who died in 1824 and 1825. Their numerous children were farmed out to various relatives. According to my sources, SMITH Sizemore was one of their children. Smith Sisemore and Henderson appeared together on the Owsley County Tax Lists with a WILLIAM Sisemore in 1844-1846. (William and Smith in 1844 - 46, and Henderson in 1846). William Sizemore, born 1793, is on the 1820 Clay, 1830 Perry, and 1840 Clay County census records with sons in the right age group for Henderson. According to Henderson's Discharge paper from his Pension record, he was born in Perry County in 1821 (the year Perry County was formed from Clay and Floyd). The only Sizemore listed on the Perry County Tax List for that year is a William, but JAMES is listed on the Clay County list. Henderson had a SON named William who could have been this William's namesake. He in turn had a son named Lewis (notice child #6 in this family). All of this seems to indicate that this family was closely related to Henderson. According to the 1850 Breathitt County Census, William [age 19 at the time of the war] was a volunteer in the War of 1812, On our last trip to the National Archives, my husband and I found a Pension Application file for Anna Sisemore, widow of William, dated June 25, 1872, but since she married William after the "Treaty of Peace" in 1815, she was not eligible for a pension. Our problem before, in findiing William in the War of 1812, was that we were looking in an Index for TN (where William was born), but he was probably already in KY by then, living in his father's household. William served in Capt. Blankenship's Company of the Virginia Malitia. Even though the 1850 and 1860 Breathitt Co. Census records have his birth year as 1795 or 1797, William first appeared on the Clay County tax list, as male over 21, in 1814, making him born about 1793. William was deceased by June 25, 1872 when Anna applied for a Widow's Pension under the act of July 14, 1871. She was living in Breathitt County when she filed. The marriage ceremony was performed by John Gilbert, a Baptist preacher, in the home of William Begly. -Ref. Pension Application of Anna Sisemore. 1850 Breathitt Co. KY Census, Dist. 1, HH 101, - 1797, TN. 1860 Breathitt Co. KY Census, District 1 - 1795, TN. War of 1812 Pension Application of Anna Sisemore, dated Jun 25, 1872, obtained at the NARA. 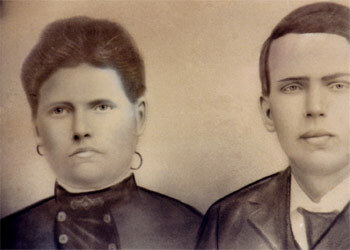 Margaret Combs Shepherd, d/o Tildon Combs & Bertha Stacy.